One of the fundamental operations in today’s user interfaces is pointing to targets, such as menus, buttons, and text. Making an error when selecting those targets in real life user interfaces often results in some cost to the user. 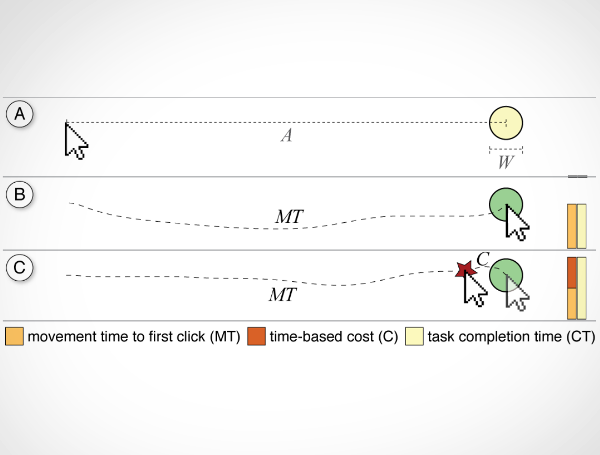 However, the existing target-directed pointing models do not consider the cost of error when predicting task completion time. In this paper, we present a model based on expected utility theory that predicts the impact of the error cost on the user’s completion time for target-directed pointing tasks. We then present a target-directed pointing user study, which results show that time-based costs of error significantly impact the user’s performance. Our results also show that users perform according to an expected completion time utility function and that optimal performance computed using our model gives good prediction of the observed task completion times.